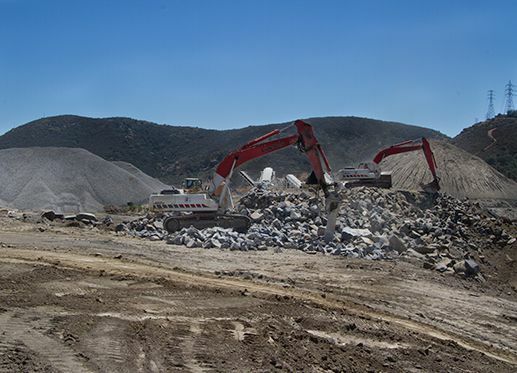 Crushing systems owned and operated by TC Construction have the capability to be placed onsite and process materials native to the job site as well as to crush up to 95% of concrete and asphalt removed from a project. Our crushing system is perfectly suited to manufacture pipezone materials as well as materials to be placed in the structural section of roadways. Material will be crushed with a new state of the art Metso crushing system that includes both jaw and cone crushers. The crushers use optic eyes to control loading and crushing speeds and include highly effective dust suppression systems. During crushing, powerful magnets remove all steel rebar for recycling. Full digital scales are used in conjunction with the crushing system to track all material crushed and provide an accurate count for tonnage processed. Our crushing system is one of the quietest in the United States and has recently been used on a sewer pipeline project at a public equine facility. The crusher was positioned in the center of facility with no impact to the public or the animals. TC Construction has successfully completed many projects with strict recycling requirements and we believe onsite crushing to be the most cost efficient and ecologically friendly process to remove and handle the large amounts of inert material produced from demolition projects. We are committed to partnering with the owner or public entity to continually set new standards for environmentally friendly ways to perform demolition and rebuilding operations.